Three people have appeared at the Old Bailey charged with the murder of 10-year-old Damilola Taylor. Hassan Jihad, 20, of Peckham, south-east London, and two brothers, aged 17 and 18, also face manslaughter and assault with intent to rob charges. A jury was selected and will be sworn in on Tuesday before the case against the three is opened. 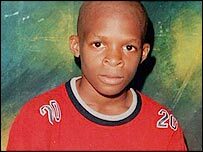 Nigerian-born Damilola was stabbed in the thigh with a broken bottle in 2000 as he made his way home in Peckham. Four youths were acquitted of his murder in 2002.